Guys, I have a confession. A confession that will surprise all of none of you if you’ve been with me for any length of time. My confession: I like my hot chocolate extra. Extra chocolate. Extra marshmallows. And a big ol’ helping of extra indulgence. Why? Well one, because I’m an adult and I do what I want. And two, because winter is me time. Summer bod? Hibernating under three layers of sweaters and a parka. Leg shaving? Optional… at best. More pajama pants wearing than should be legal? Probably. Snuggled up somewhere next to a heater with a warm beverage? You know me too well. And as long as we’re indulging, we might as well be extra about it. So extra, that we make our own marshmallows… colorful marshmallows… in festive holiday flavors. The trifecta of extra. 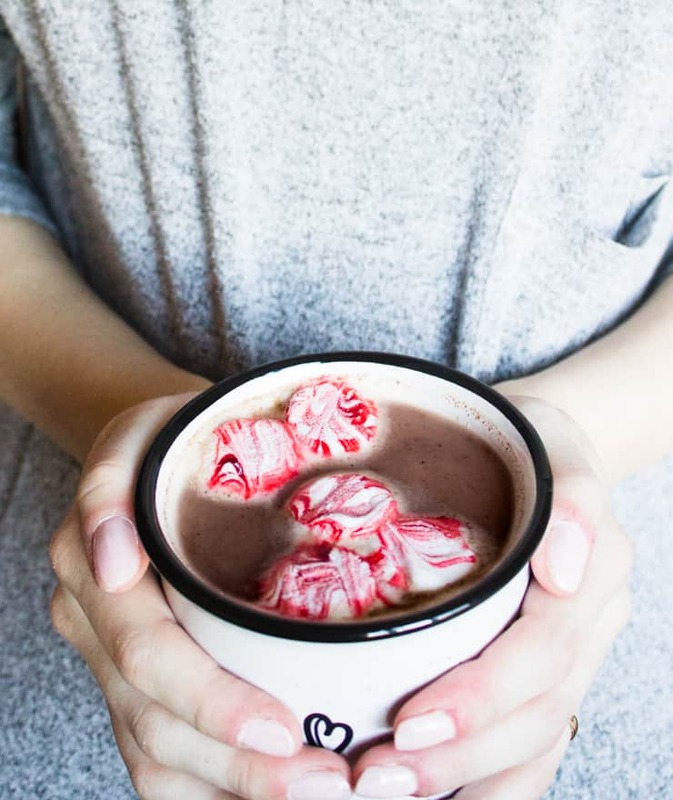 So go ahead, cozy on up to that heater and grab yourself a hot cup of chocolate with a heaping handful of these peppermint marshmallows. Here’s to us time! Pajama pants: optional. 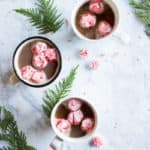 Whether you’re popping these babies in hot chocolate or starting a new trend in the world of s’mores, these from-scratch peppermint marshmallows are sure to be a hit! ¼ cup water + 2 tbsp. In a small bowl stir together the gelatin and 2 tablespoons of (ice cold) water. Set aside so the gelatin can absorb the water. In a small saucepan whisk together the corn syrup, granulated sugar, and ¼ cup water. Bring to a boil and allow to cook until a candy thermometer registers 235F/113C. In the meantime, beat your egg whites until they hold soft peaks. Once the sugar mixture reaches the right temperature, whisk in the gelatin (be careful with your hands because it’s likely to release hot steam when you do this) and stir to dissolve. Slowly add the hot mixture and vanilla extract to the egg whites and whip until stiff (about 8-10 minutes). Cover a baking sheets with parchment paper and dust generously with sifted powdered sugar. Pour the marshmallow out onto the parchment paper and spread until it fills the baking sheet. Using a butter knife or offset spatula, swirl some red gel food coloring across the top in whatever pattern you like. Let the marshmallow firm up over night. Once the marshmallow is firm, dust the top of the with sifted powered sugar. 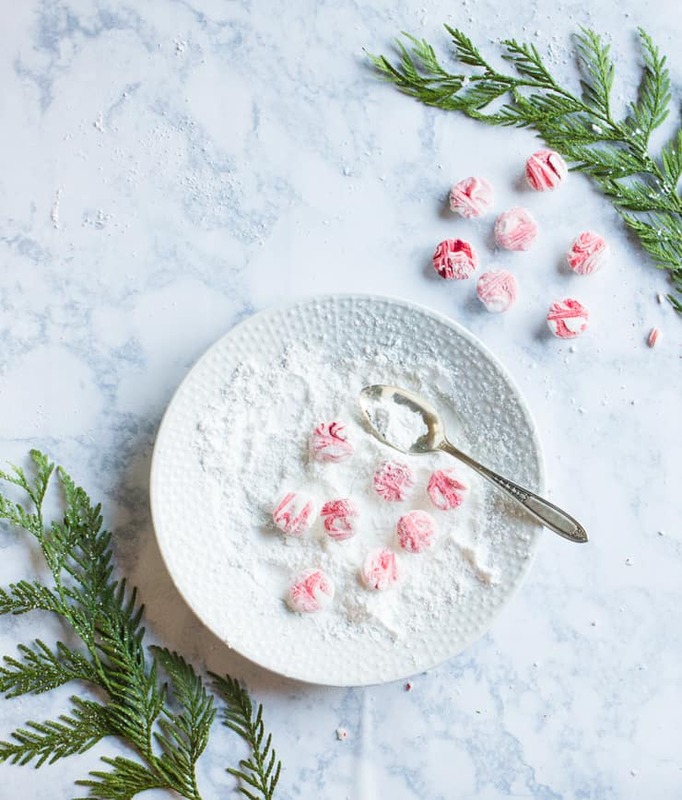 Use a small circular cookie cutter or piping tip dusted with powdered sugar to cut out circular marshmallows. Roll the cut marshmallows in powdered sugar until no long sticky. Dust off any excess powdered sugar. « The Cutest Reindeer Cake EVER. OMG these are so pretty. I have never made marshmallows. 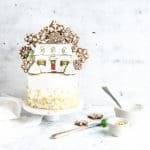 After seeing how awesome these look, sounds like some fun in the kitchen. I’ve never made homemade marshmallows, but these I’ve GOT to try! They are so festive and would the perfect handmade holiday gift. They look so tasty! 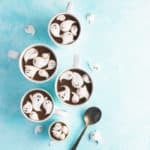 I’m with you on the hot chocolate: the richer, the better! I’ve yet to make my own marshmallows, but these are pretty enough that I just might try it. I made my own (plain) marshmallows once, but they were nowhere near as pretty as these. I can just imagine how amazing these must taste in coffee and hot chocolate. Definitely going to give them a try!! This is a super creative idea – love it! And your photos are great too! The marshmallows look so lovely! I would spend the entire winter in comfy clothes too with some of these if I could! Thanks for sharing! I like my hot chocolate with extra chocolate too. What I have still not tried yet is adding marshmallows, I don’t know where to get them and I am bit lazy in making them from scratch. I wish I could have a cup full right now!! Oh! How fun are these and oh so pretty! I’ve not heard of anything like this before! 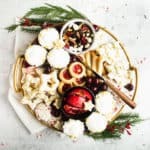 This would be so fun to make during the holidays and over the winter months! Pinning this one for later! I’ve been wanting to make marshmallows for a while. This is the perfect recipe for the season. Pinned!! Omg I’m in love! 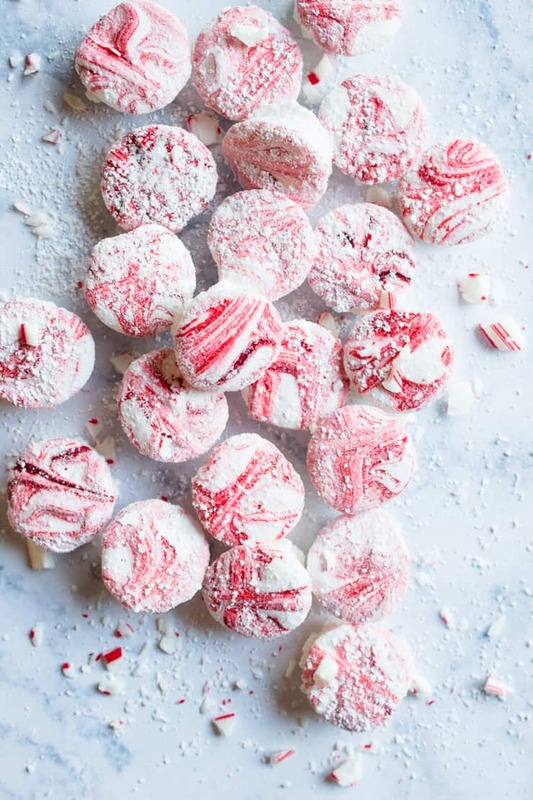 Marshmallows + Hot Chocolate is a natural combination, but I never thought about peppermint! 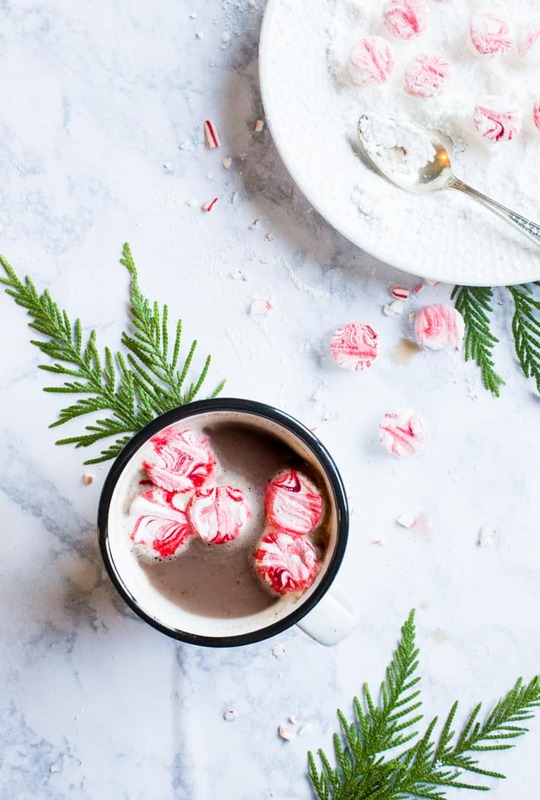 This sounds so delicious, like a creamy peppermint mocha! 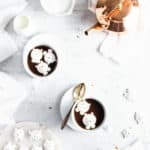 These are gorgeous– and I am sure they make hot chocolate extra special! These are gorgeous – really pretty photography! 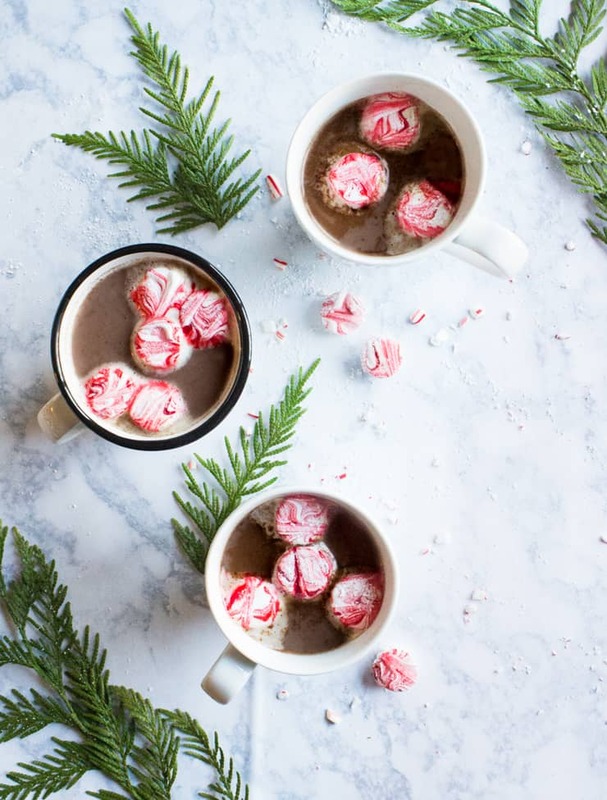 And I’m with you – if you’re having hot cocoa, you might as well have it with the fixings! These are gorgeous! I know they have to be great in cocoa!